Si-Bell ® Menstrual Cup Review - Is it Your Cup, Yes or No? 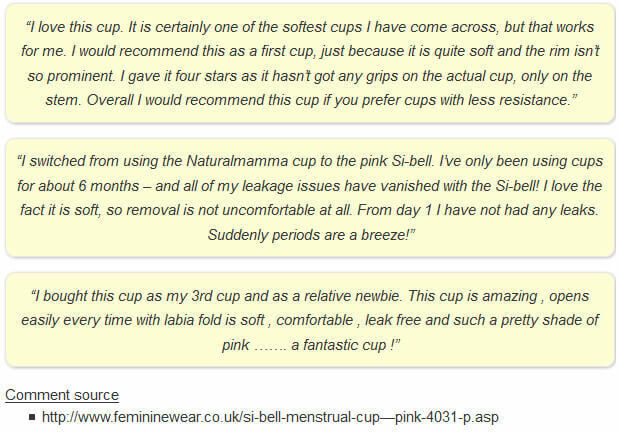 Home » Menstrual Cups » Si-Bell ® Review – Is it Your Cup, Yes or No? Si-Bell ® Review – Is it Your Cup, Yes or No? Note: We're just reviewers of the Si-Bell, we don't sell it. However, you can get the best deals by shopping on the list above. Note: Similar cup design/model can be found under the following name(s): Other names depending on location: Amulette, BeCup, ClariCup (4 sizes), So'Cup, Soch Cup, Sustain Cup, and others. Menstrual Cup manufacturers have raised the bar when it comes to producing new cups that have to compete with all types, designs, and features. Women are learning that when it comes to menstrual cups one size is not for all. Some women prefer firm cups and some softer, others want a long stem, ball stem, or want to be able to safely trim the stem for a better fit. No matter what the case, there is definitely a menstrual cup out there that you would swear is made just for you. Maybe you just have not found it yet. But do not give up, as yet again Menstrualcupreviews.net has found another menstrual cup made in Europe that may have all the specifications that you want or would ever need from a menstrual cup- the Si-Bell menstrual cup. Could it be your YES cup? 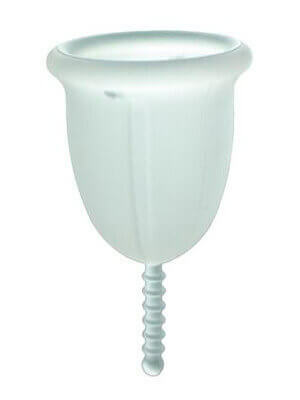 The Si-bell cup is a basic menstrual cup with a very unique design (aren’t they all.) It features a stem that is very unlike other menstrual cup stems it is elongated with ridges, that is shaped much like a unicorn horn- except it has a ball stem at the tip. The Si-Bell cup has no special flares, although it is available in 2 model sizes (small and large), and comes in a translucent cup color and now a baby pink limited edition color. Each purchase of a Si-Bell menstrual cup includes an information packet, a single menstrual cup (in size and color choice), and with an unbleached carrying pouch. 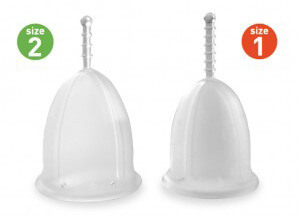 Small / Size 1: The (S) Small Si-Bell menstrual cup is recommended for use by a woman that is 30 years of age or younger, has had a c-section, or NOT had a child vaginally. The size and design of this cup can accommodate a light/medium flow. 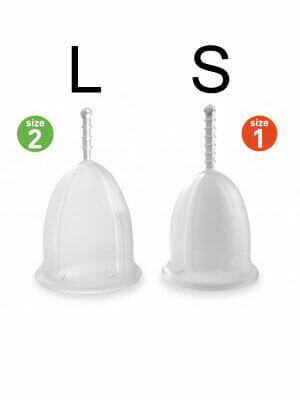 Large / Size 2: The (L) Large Si-Bell menstrual cup is recommended for use by a woman that is 30 years of age or older, has had a c-section, or has a child (or several) vaginally. The size and design of this cup can accommodate a medium/heavy flow. The Si-Bell menstrual cup is available in the dye-free clear cup form, or now is made in a light pink hue for a limited time. 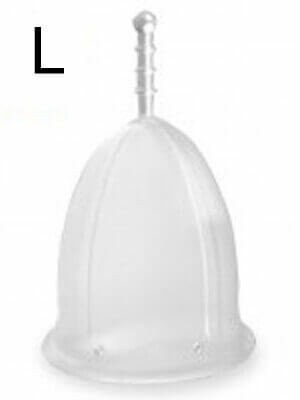 The Si-Bell as similar to the Fleurcup (says some reviewers) has many small features and characteristics that are impressive. Here are a few of the attributes of the Si-Bell cup to help you consider whether it could be the right cup for you or not. There were some happy females that did not hesitate to share their remarks and feedback on this menstrual cup. Here are some of the biggest pros that the Si-Bell menstrual cup boasts. 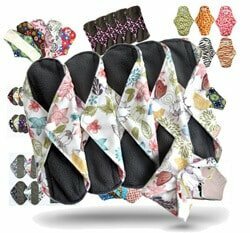 Very soft cup – The most expert reviewers of all menstrual cup kinds, have stated that the Si-Bell menstrual cup is one of the softest cups on the market of hundreds. This makes the cup phenomenal for women who know exactly how to fold and pop the cup open. Good beginner cup – Even though it is quite soft, remarks were stated that lead me to believe that many women would recommend this cup to a newbie cup user. It does not leak, and there is not so much of a learning curve to ease insertion and removal. The stem ball and grips are great – This menstrual cup really boasts a uniquely designed stem that possesses grips on the handle but also leads to a solid ball at the end. Users remark that this is fantastic for removing it (there is no fishing for it- and the stem ball you grab, pull, and release. Great packaging and instructions – Women were quite taken with the packaging of this brand of menstrual cup. The Si-Bell comes well equipped with instructions and a nice box that is safe for the environment that contains all sorts of information on it. Comfortable and squishy – Because of the soft stature of the Si-Bell cup, ladies say it is squishy and comfortable to wear. No pokes, adverse ridges or textures, totally smooth and unnoticeable when you are wearing. Cup is soft, but also can be slippery when inserting and removing – The finish of the Si-Bell menstrual cup is soft and smooth (other than the stem) – some women remark that it could be too soft for some to easily use. The Si-Bell is very soft indeed, however it may be worth your while even though it may come with a learning curve. It is still recommended by most patrons as a very viable beginner cup that DOES NOT LEAK. We are sure you have many questions in your mind about the Si-Bell menstrual cup. 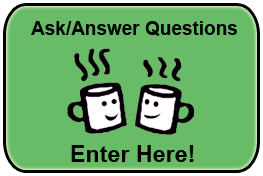 So we have decided to dedicate this section to answering some of the most frequently asked questions that consumers have regarding the Si-Bell cup. Yes. 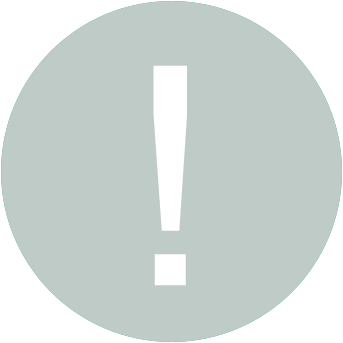 The Si-Bell is actually made by a company that focuses on distributing & manufacturing safe-silicone products for intimate uses and other medical uses. 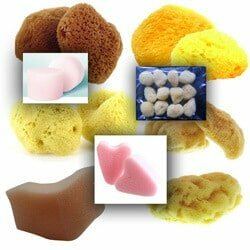 It is hypo-allergenic, 100% non-toxic, and FDA approved and monitored for safety for intended use. 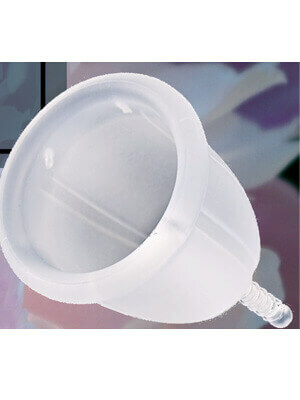 Your Si-Bell menstrual cup should provide you 100% no-leak protection. In the case of wrong fitting, or not emptying in time the cup can leak. The company recommends that newbies use pads as a back-up during the initial uses of this menstrual cup. The Si-Bell was first designed to be dye-free, but after evolution and testing out new trends the company is now offering a beautiful pale pink hue in the cup for a limited-time only. No. This is not a menstrual cup that has been tested or proven safe for wear during ANY sexual activity. Do be sure to remove the Si-Bell cup before partaking in sexual activity. Yes. Women who find the stem of the Si-Bell overwhelming found their best comfort by removing it. It can be trimmed easily but be sure not to damage the cup- and remember that without that stem it may be more difficult to remove. Many women have issues using menstrual cups or certain brands all are not exact for every woman. Consult with the instructions, practice, AND be patient as most women discover that after perfecting the techniques of use- they LOVE their menstrual cups. Wow! 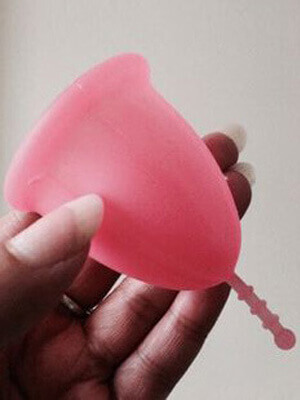 This menstrual cup is really soft and built to be the most comfortable. If you find yourself in pain with use, you should reconsider the size you opted for (maybe you need a smaller one), maybe it is inserted wrong, or you just have not got the knack of using a menstrual cup yet. 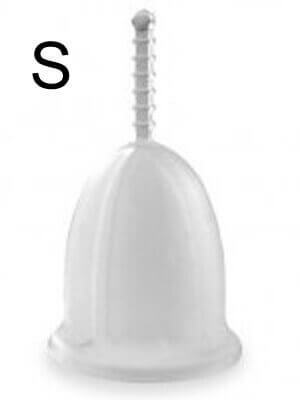 The Si-Bell is a very discreet means of providing you with the best menstrual leak protection. No strings, and you can wear it while swimming, bathing, exercising, and more without anyone knowing you are wearing it! The Si-Bell menstrual cup is actually made by a European based company that produces all types of platinum silicone medical-grade devices and products. The Si-Line company is famous for manufacturing top of the line baby products, food-safe products, and medically used hygienic products. This company offers its well-known product lines all over the world- but namely the Si-Bell menstrual cup is the most popularly known product of its time. Overall the Si-Bell menstrual cup is very well-made, and it boasts many features such as the ball/ridged stem that makes it extraordinary for some women who want a menstrual cup that is easy to insert and remove. It’s of a softer nature that permeates comfort, although it may be a trite difficult using at first until one learns how to fold it, pop it open, and use a dry-touch to remove it. The Si-Bell cup is high-quality, and many women have switched cup brands after discovering what the Si-Bell cup offers them. You may just be one of these women. So be sure to shop well, and consider the Si-Bell strongly if you just have not discovered the right menstrual cup for you, yet. The Si-Bell is offered by many vendors all over the world, Ukraine, France, Germany, and more… You can purchase this menstrual cup discreetly online through the many trusted vendors that we recommend in the links at the top of this page. I thought I preferred firmer cups until I tried the si-bell. I was on the hunt for a softer cup because the suction on my previous cup was just too strong for me and my new IUD (Paraguard). I love this cup. It is so soft and comfortable and the longer stem is perfect for my high cervix. The cup pops open every single time with the labia fold and seals very easily with a little pull on the stem. I cannot feel this cup at all and it has even helped with my menstrual cramps that I’m starting to believe were caused by tampons. I thought this cup would be too soft for me because I have a pretty strong pelvic floor but it has held up great, even at the gym. I wish I purchased this cup sooner and wasn’t so scared to try it because of the softness because I would have saved lots of money on cups. My search for the perfect cup is over because my large si-bell is it. I love this cup with my IUD because it is so soft it doesn’t pull on my cervix during removal like some firmer cups did. It is so easy to remove and is comfortable 100% of the time. - CONS: Can't think of any! This is a very comfortable cup. It’s almost as soft as the meluna soft cup but opens up much better. I’ve never needed grip rings to remove a cup, so that’s not a problem. The only drawback is the pouch. It’s a white silicone type bag that is no good at all for allowing the cup to breathe. I threw the pouch away and plan on making my own. - CONS: That stupid pouch. Who's idea was it anyway to make a pouch for storing a menstrual cup three weeks out of the month out of a nobreathable material so it can grow mold?? I really like this cup, but it is constantly leaky for me. :/ So i always end up back at SoftCup or pads. If the cup leaks, you might be better off with a firmer cup. My fav cup. Very soft, but it pops perfectly. Thanks to the veins I can fold it in two during extraction. Good suction! I’m quite happy with its capacity, on the really heavy days I empty it every 5 hours. One of my favorite soft cups. It feels like you have NOTHING THERE. Perfect for when you’re cramping and can’t deal with firm cups. And, works well for times between menstruation if you tend to be more moist during ovulation than most. I am SO GLAD I purchased this cup. Love this cup. It is so soft yet it pops open with no troubles due to its ridges/veins on the sides. No leaking and a nice looking cup. I wish this had been my first cup.